The main face of the seal is identical to the coat of arms, without the horses and motto banner. The shield displays a sailing ship (carrying state commerce to all parts of the world), a clay-red plow (signifying Pennsylvania's rich natural resources), and three sheaves of wheat (suggesting fertile fields and Pennsylvania's wealth of human thought and action). To the left of the shield is a stalk of Indian corn; to the right, an olive branch (signifying peace and prosperity). 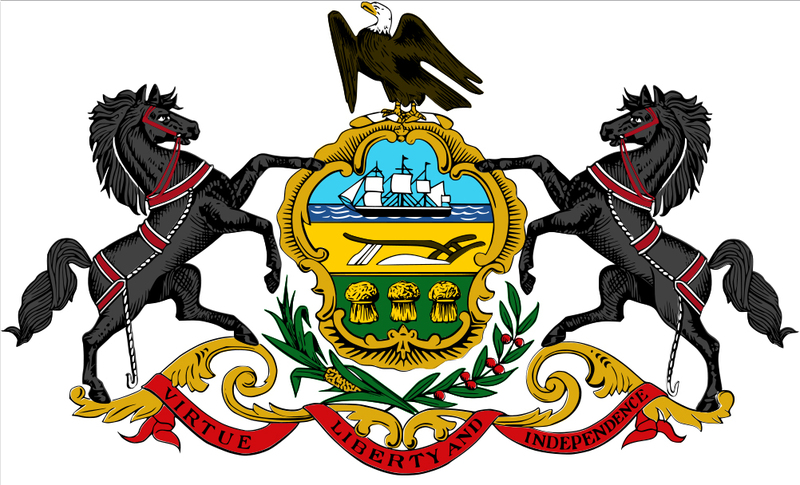 The shield's crest is an eagle; and the design is encircled by the inscription "Seal of the State of Pennsylvania." 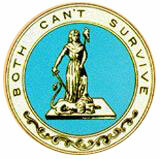 The counter-seal portrays liberty vs. tyranny. A woman represents liberty; her left hand holds a wand topped by a liberty cap (a French symbol of liberty), her right hand holds a drawn sword. She is trampling upon Tyranny, represented by a lion. The entire design is encircled by the legend "Both Can't Survive." 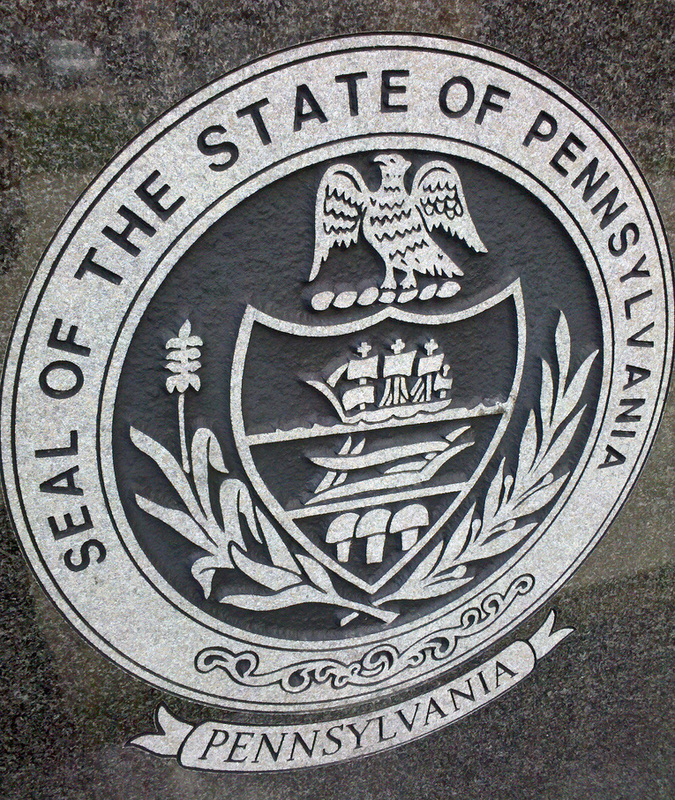 Representation of Pennsylvania's state seal in Pine Creek, PA; photo by Matt Green (Hobo Matt) on Flickr (noncommercial use permitted with attribution / share alike). 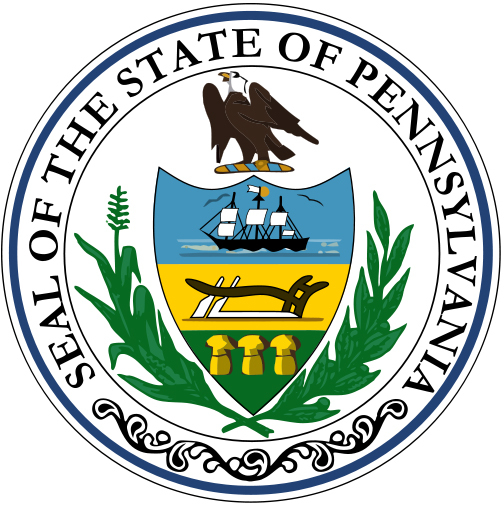 Pennsylvania Coat of Arms (public domain image on Wikipedia). Pennsylvanis state seal reverse (public domain image on Wikipedia).